Plants vs. Zombies for iPod Touch, iPhone : Now Available in App Store! We're already a bit behind on this -- But yes, an updated version of Plants vs. Zombies for iPod Touch and iPhone, is now officially available for download in the App Store. This version features more content, mini games and achievements, including Wall-Not-Attack that gives access to complete ZomBotany without using tall-nuts, wall-nuts or pumpkins. The game costs only $2.99 and weighs 46.1 MB. 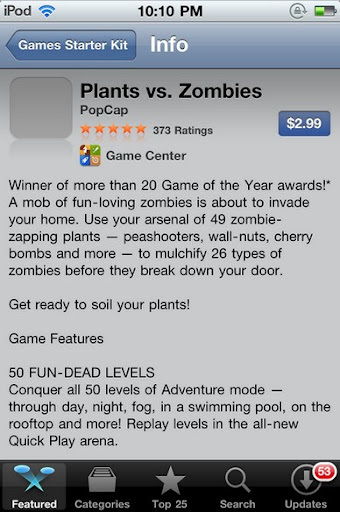 To get it on your iDevice, just go to the App Store, click on the search icon, type 'Plants vs. Zombies' in the box and hit the button, then download Plants vs. Zombies from PopCap. oh come on, this has been available for months now. What gives? this is for the updated version, I think. still late but at least they wrote about it. love pvz.